Watch the "A Year in the Life" documentary! Capital Institute has just released our first documentary, "A Year in the Life of First Green Bank," the culmination of our yearlong collaboration with Central Florida's First Green Bank and its CEO Ken LaRoe. Ken, a traditional banker with a track record of success, founded the bank in 2009 after the lucrative sale of the first bank he founded. On a cross-country, soul-searching trip he had read Yvon Chouinard's book Let My People Go Surfing and had committed himself to a new way of banking. As a member of the Global Alliance of Banking on Values, First Green Bank sought to use finance to deliver "sustainable economic, social and environmental value." Indeed Ken's intention was nothing less than to be a countervailing, regenerative (truly sustainable) force in the conservative rural community outside Orlando where the bank operates. As part of Capital Institute's collaboration with Ken and the bank, we followed him as he steered an often-difficult course at the intersection of an extractive economy focused on short-term financially driven, real estate speculation, and an emerging, regenerative one that supports the long-term health of people and planet. As Ken struggled with his own, sometimes conflicting, personal goals for the bank, we also witnessed the tremendous external pressures he encountered, including pressure from investors to sell the bank. We also met employees attracted to the bank's mission who were eager to be agents for regenerative change. In Capital Institute's role as both observer and activator for this project, we also introduced Ken, his staff, and the bank's investors to mentors who challenged them to embrace a more deeply holistic-value business model. A Year in the Life posed a critical question: Can the tools of finance and banking be used, not just for short-term financial gain, but to support the regeneration of our human communities and economies, and the stressed ecological systems upon which they depend for their very survival? Can a bank be profitable and also serve as a regenerative change agent? We concluded with no easy answers but with the strong conviction that the work that First Green Bank aspires to do is crucially necessary in these uncertain times. 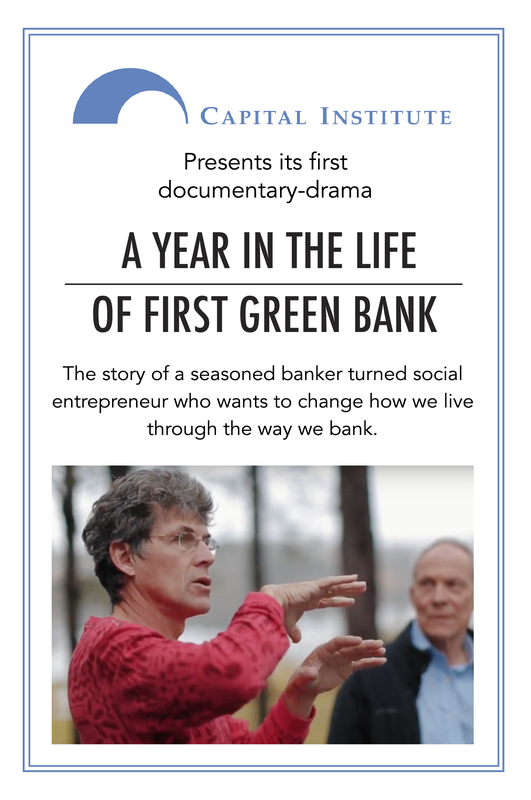 We see First Green Bank's story and struggle as a metaphor for all of finance and banking today. It will resonate with all of those who want to go beyond a narrow definition of sustainability. Interested in holding a screening of "A Year in the Life" in your community?